This pocket door pull comes plated in satin nickel. It fits a 1-3/8 in. thick door and includes a die cast pull hook. This pull comes complete with fasteners for a quick and easy installation. Goods are warranted against manufacturing defects for 1 year. In no case is Prime-Line responsible for user related damage or damage incurred during installation. Warranty is void if products are subjected to abnormal conditions, misapplication or abuse. Screen door and storm door exit bar. The Ideal panic bar set for storm and screen doors allows for both an easy exit and entrance into the home. From the outside, just pull on the easy opening PULL handle and from the inside just push on the bar to unlatch the door. Easy to install, the touch bar is great for kids and very handy for doors used often especially when hands are full. The outside pull handle replaces and standard storm door push button handle. Now new holes are needed for a standard 1-3/4" installation. Everything needed for a quick installation is included. The SK4390 includes inside and outside handles and all screws and brackets for installation. This latch shield is constructed from steel and comes in a painted gray finish. It measures 3 in. x 7 in. Helps to protect your outswinging doors from forced entry. This combination strike is designed for maximum security. Six 3 in. long screws attach to your wall stud for extra strength. It replaces standard latch and deadbolt strikes with one piece security. 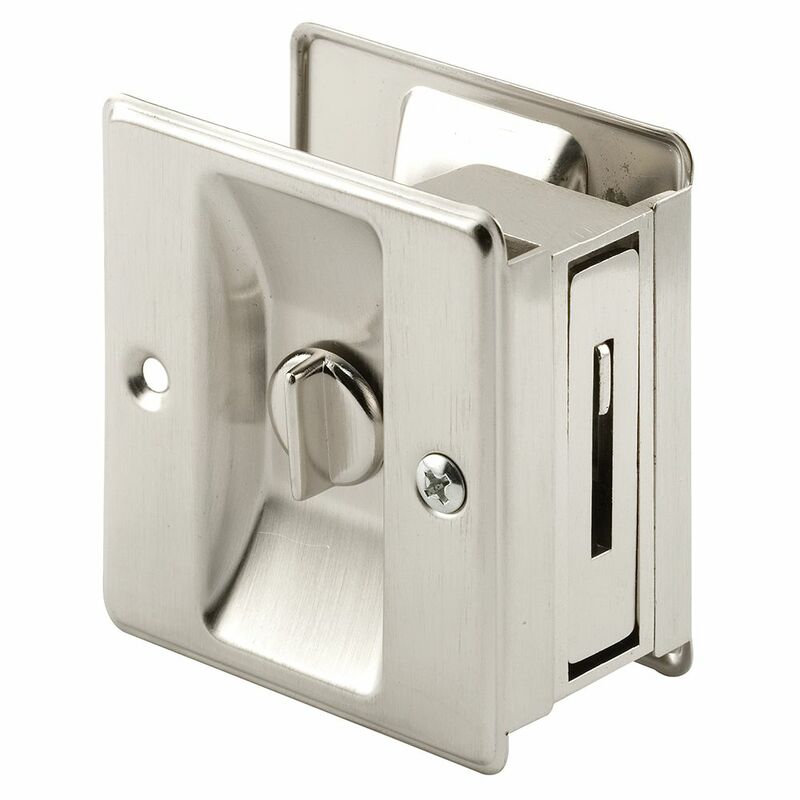 Satin Nickel Pocket Door Privacy Latch This pocket door pull comes plated in satin nickel. It fits a 1-3/8 in. thick door and includes a die cast pull hook. This pull comes complete with fasteners for a quick and easy installation. Satin Nickel Pocket Door Privacy Latch is rated 3.8 out of 5 by 51. Rated 1 out of 5 by PW from Did not cover the hole the old latch was in. Did not cover the hole the old latch was in. Rated 5 out of 5 by Breck from Easy to install and looks great!... Easy to install and looks great! Rated 1 out of 5 by learnedhardway from Had the same issues as others described. On a 1 3/8" pocket door left to right close for some rea... Had the same issues as others described. On a 1 3/8" pocket door left to right close for some reason binds up. You can add shims to give the door a little more thickness but then it looks bad because then the face plates aren't flush to the door. Writing this one off and am looking for something else to replace with. $13 in the toilet. Lesson learned. Rated 5 out of 5 by pieman from fit great, looks good!!... fit great, looks good!! Rated 5 out of 5 by Krista from Replaced old brass one and did it in 5 minutes.... Replaced old brass one and did it in 5 minutes. Rated 5 out of 5 by HomeDepotCustomer from Excellent quality product which had good instructions and was easy to install. Excellent quality product which had good instructions and was easy to install.